It’s no longer a secret that Subaru wants to bring the seven-passenger SUV back to the U.S., but the 2017 New York Auto Show confirms that the vehicle is very close to arriving in dealerships. 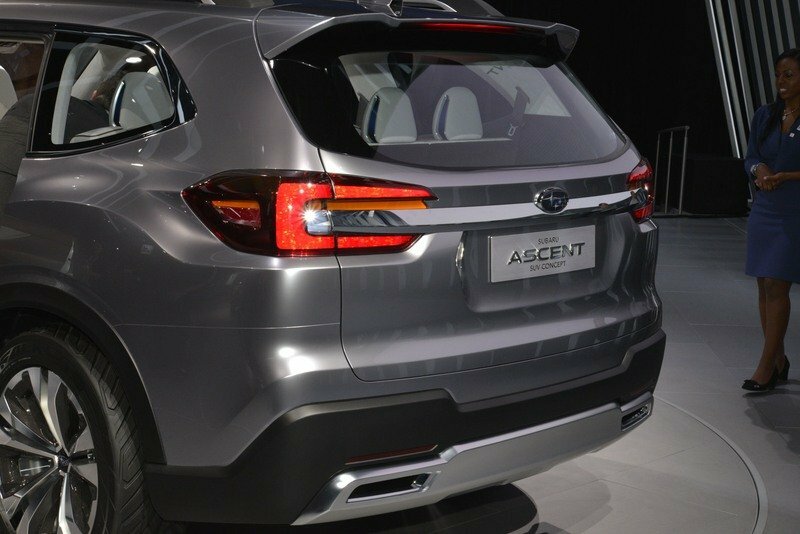 Specifically, Subaru announced that the Ascent concept will go on sale in 2018 as a spiritual successor for the Tribeca. Based on the Viziv-7 concept showcased in 2016, the Ascent is much closer to production form, but it will likely lose some of its features before hitting the assembly line. Subaru’s confirmation of the seven-seat SUV and Ascent name comes after 64 months of consecutive record-breaking sales in the United States. The Japanese firm has been growing slowly but steady in North America, and it now needs to step into new markets to keep the hype alive. A seven-seat hauler seems like a safe bet, especially with not so many companies offering this type of layout nowadays. The Ascent will be built at Subaru of Indiana plant in Lafayette and won’t be sold outside North America. Until the production model arrives, let’s find out more about the concept car in the review below. 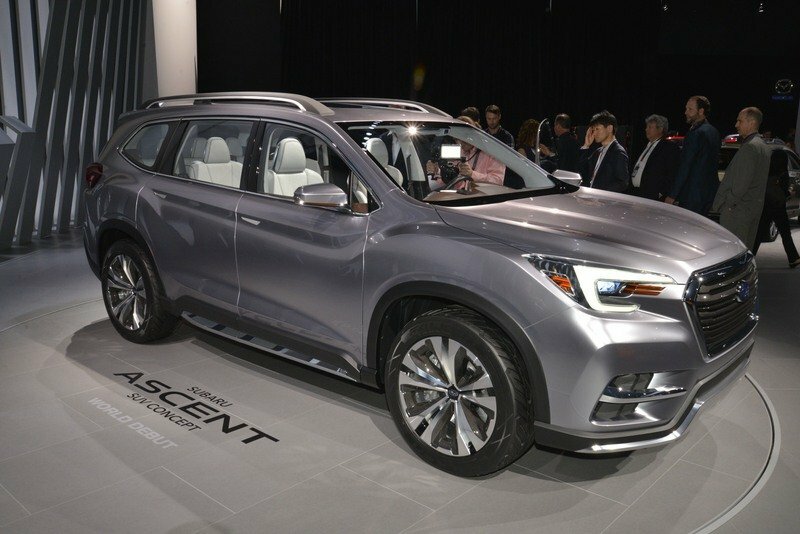 Continue reading to learn more about the Subaru Ascent concept. 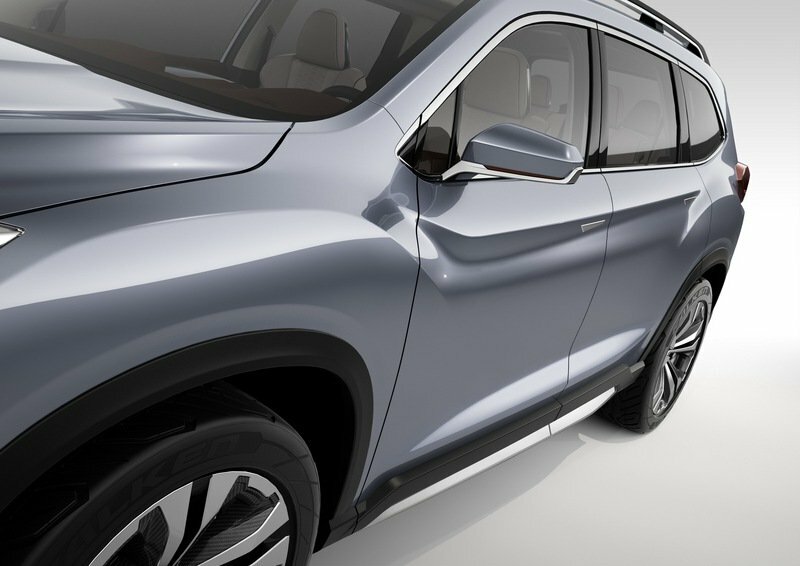 The design of the Ascent concept follows Subaru’s “Dynamic x Solid” theme and keeps it recognizable. 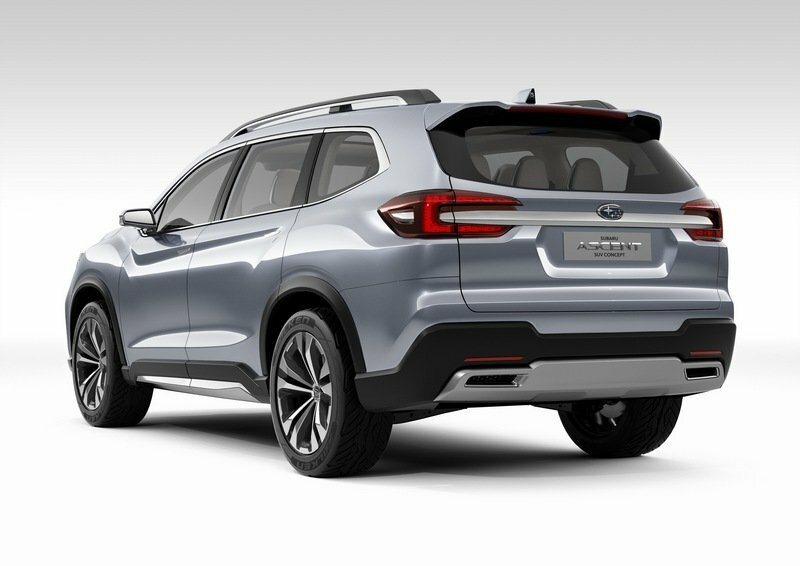 The design of the Ascent concept follows Subaru’s “Dynamic x Solid” theme and keeps it recognizable compared to other Subaru vehicles. The front fascia looks powerful thanks to its massive grille flanked by C-shaped headlamps, while the beefed-up bumper and front fender flare arrangement give it a proper SUV appearance. The profile is pretty much standard crossover stuff, but the beltline is quite spectacular. Descending from the front fenders just below the A-pillar, it continues as a deeply sculpted crease underneath the door handles and disappears into the rear haunches. A similar character line highlights the area just above the black trim of the side skirts. The machined wheels and the chrome trim on the sleek looking side mirrors add a bit of style to the profile’s otherwise rugged looks. The Ascent feels like a well-balanced combination of rugged SUV looks with stylish and sporty elements. The rear fascia is dominated by a big chrome strip above the license plate recess. The thick element runs deep into the taillights, which in turn extend well into the fenders. A sporty spoiler sits atop the tailgate, while the bumper is of the standard SUV variety save for the thin and wide exhaust outlets. Overall, the Ascent feels like a well-balanced combination of rugged SUV looks with stylish and sporty elements. In this form, it’s among the best-looking crossovers in its class. 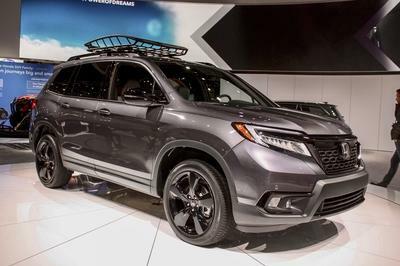 As far as dimensions go, the Ascent is 198.8 inches long and 78.3 inches wide, which make it as big as the Chevrolet Traverse. And even though the wheelbase is some three inches shorter, the Ascent’s roof sits two inches higher, which should translate into better headroom for all passengers. Of course, it remains to be seen if these dimensions will carry over to the production model. The styling is definitely modern and the flowing dashboard design is gorgeous to look at. 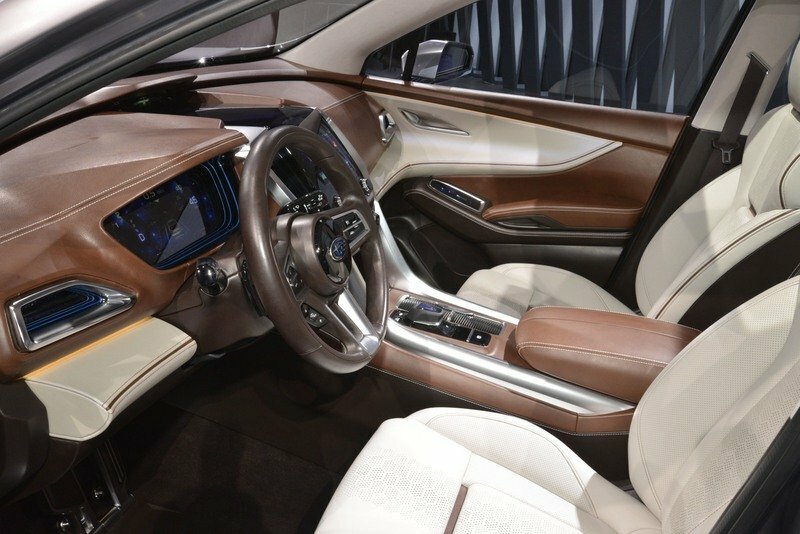 Subaru didn’t have much to say about the Ascent’s interior but released a handful of pictures. The styling is modern, and the flowing dashboard design is gorgeous to look at. The unit flows seamlessly into the door panels, while the tall and wide center console separates the driver and passenger space without taking away the necessary legroom. A massive blue-lit screen sits in the center of the dashboard, containing touch controls for the infotainment system and cool looking knobs for the menus and air conditioning system. The all-digital instrument cluster is equally dramatic and displays a ton of information, including speed, rev counts, date, outside temperature, and gear selection just to name a few. The buttons on the door panels have also been replaced by touch controls, a feature that would be cool to find in the production model. The cabin’s high-quality appearance is further enhanced by the two-tone upholstery. 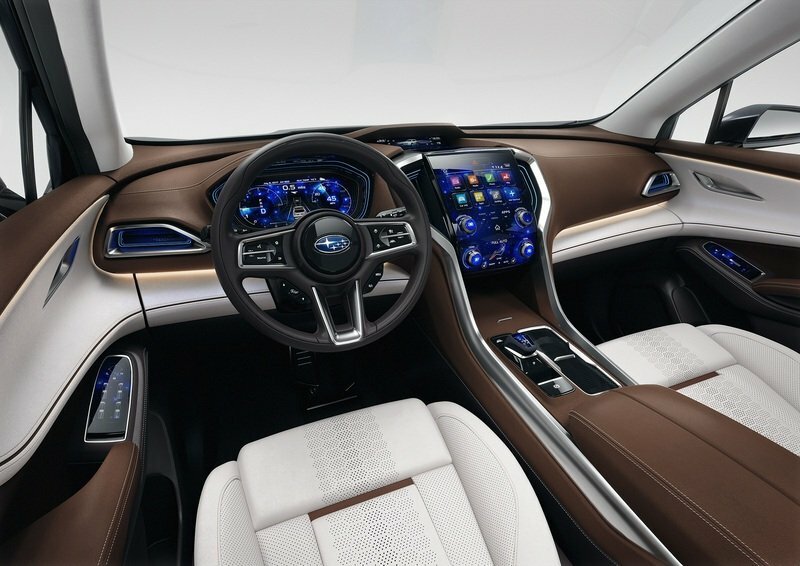 Combining white seats, headliner and door panels inserts with brown and black elements, Subaru came up with a premium-looking cabin that pretty impressive compared to other products in this range. The concept appears to offer great legroom in all compartments. 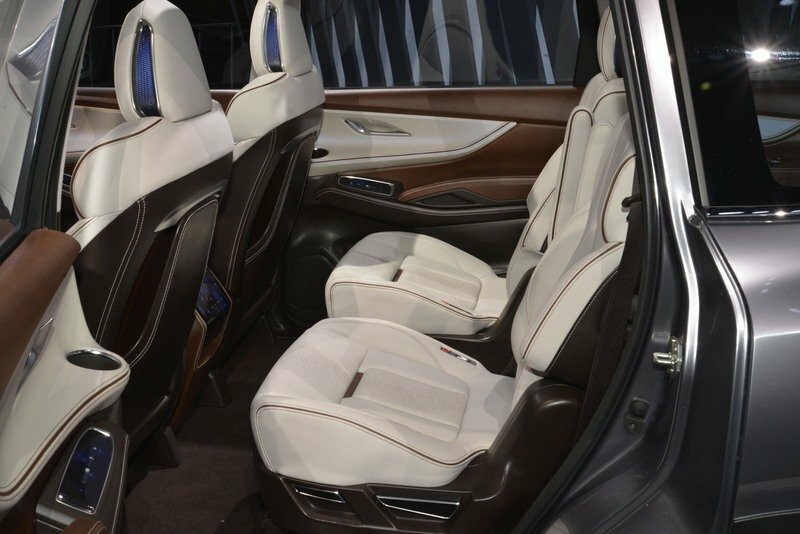 Moving over to what makes the Ascent special, the seven-seat configuration, the concept appears to offer great legroom in all compartments. The second row is arguably the most comfortable behind the front row. Not only legroom and headroom seem sufficient, but the two seats are as comfortable as the ones in the front. The third row doesn’t offer as much legroom, and it gets rather cramped with seating for three people, but it appears to offer more room that a lot of sedans out there. 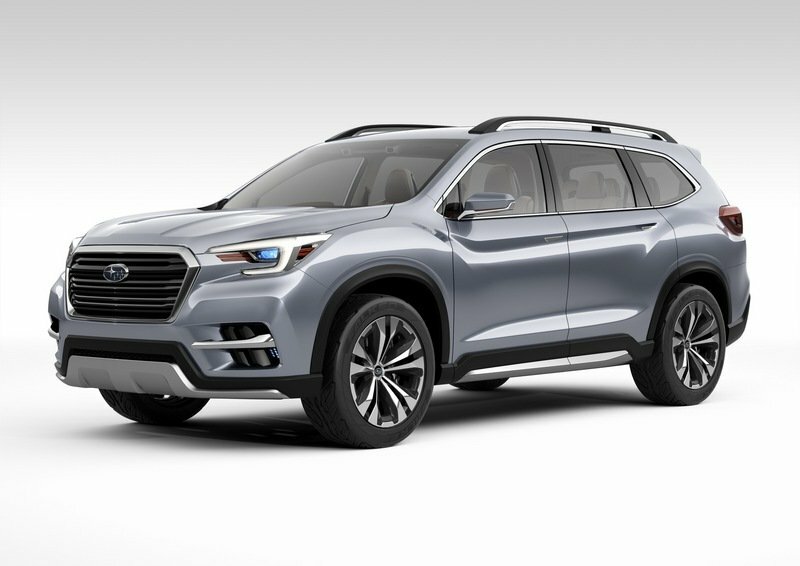 Drivetrain information is rather limited, but Subaru did say that the Ascent rides on a modified version of the Subaru Global Platform that debuted last year. These underpinnings can be found in the latest Impreza and will be used in all future Subaru models. 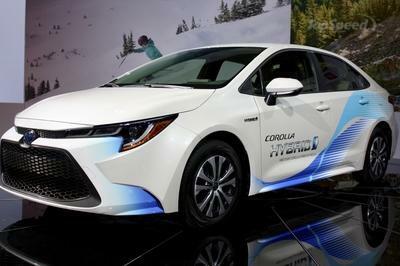 The Japanese carmaker also mentioned an all-new turbo boxer engine but gave no additional details. Chances are it will get a revised, more powerful version of the 2.0-liter flat-four in the Impreza, paired to a CVT automatic. All-wheel-drive should be standard. A Replacement for the Ill-Fated Tribeca? Subaru’s latest foray into the seven-seat SUV market dates back to 2005 when it introduced the B9 Tribeca, later called simply the Tribeca. Developed as a global vehicle, the crossover arrived in the United States for the 2006 model year. Although it was received with some interest, the Tribeca was far from popular, and sales went downhill pretty fast. As a result, Subaru decided in 2012 to discontinue the nameplate and production at the Lafayette plant was halted in 2014. Although it was initially planned to replace it with the Japan-spec Exiga 7, Subaru abandoned the idea, citing that the crossover was too small for the North American market. Significantly larger, the Ascent is the replacement Subaru has been aiming to deliver all this time. Hopefully, it will do significantly better than its predecessor. 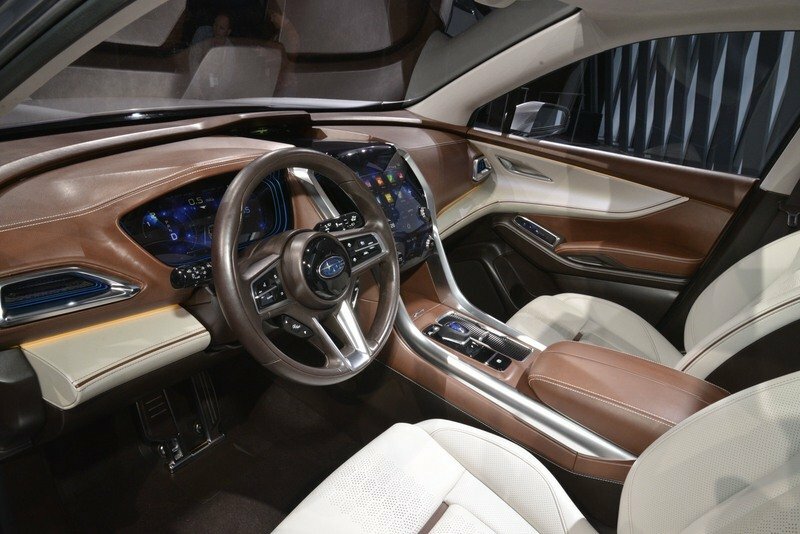 The Ascent concept appears to have everything a seven-seat Subaru needs to succeed, but we still don’t know how many of these features will find their way onto the production model. I can definitely understand that some of the concept’s fancy features may be too expensive to offer in dealerships, but Subaru needs to be smart about the Ascent. Coming up with a premium package that’s still affordable to the average Joe is one of the keys to succeed in today’s market. The seven-seat SUV niche is not as crowded as other segments yet, but this will likely change in the near future. If Subaru wants to make a stand, it needs to act fast and roll out a solid, smart proposition. 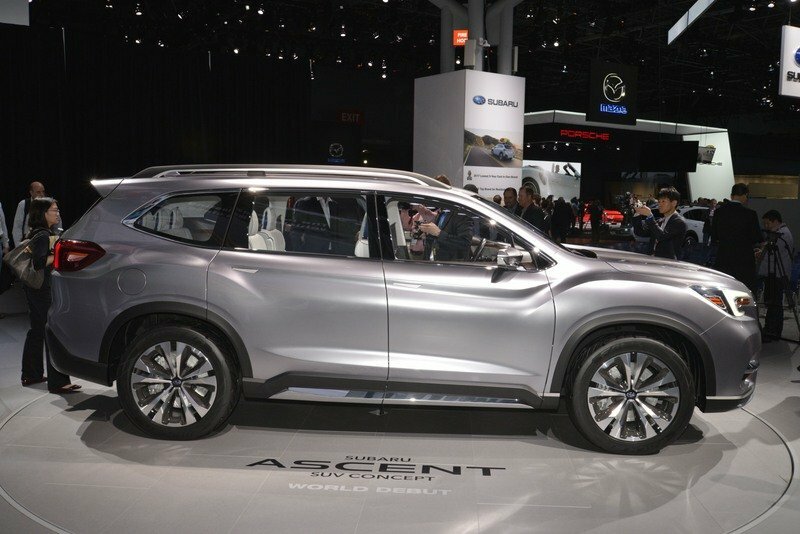 Subaru of America, Inc., which this month posted its 64th consecutive month of record-breaking sales, today made the world debut of the Subaru Ascent SUV Concept. The styling concept also confirms the name Ascent for the upcoming Subaru 3-row SUV. 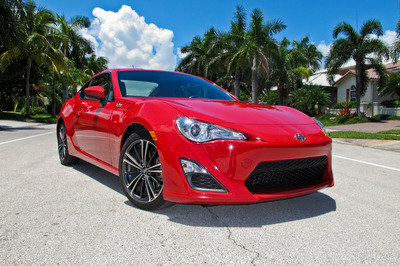 Both the design concept and the production Ascent will feature an all-new turbocharged direct injection boxer engine.